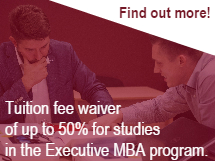 RBS Intellectual test is one of the entrance exams at the Riga Business School MBA programs and you need to achieve at least 50% in order to be considered for admission. You can take the RBS Intellectual test for free! Results are sent to you by e-mail three weeks after the test and are valid 2 years. This is opportunity to prepare better for the test and achieve good results right away! Please register by e-mail at info [at] rbs [dot] lv.